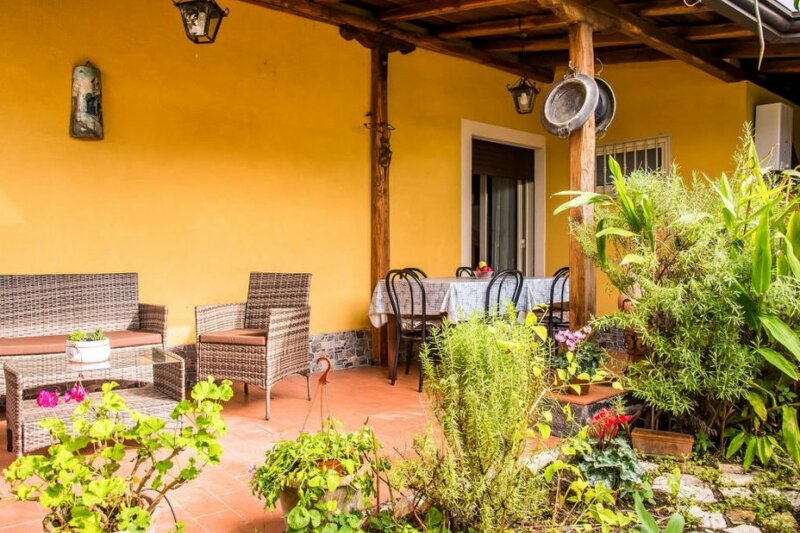 This 2 bedroom villa is located in Sant'Antonino and sleeps 4 people. It has WiFi, air conditioning and barbeque facilities. The villa is near a beach. Detached house, 4 people, 3 room/s, 2 bedroom/s, 2 bathroom/s, approximately 80 m², 1 floor/s, sea view, year of construction 1950, renovated 2015, separate access to the property. Furnishing: holiday standard, local standard, pleasant, tiled floor. Equipment: TV; internet access Wi-Fi (included); washing machine, iron/ironing board; alarm system; combined heating/air conditioning. Electricity if applicable also for heating according to consumption approximately € 0.30/​kWh. Linen/towels available. Change of bed linen/towels, € 8 per person. Deposit € 150 (in cash). Extra bed sofa bed, 2x available, € 10 per person/​day (on order). Cot/​High chair free of charge (on order). Pet 1 pet allowed, € 20 per stay (please advise prior to arrival; additional animals on request only). Situation: in the district S.
Access/parking: 1 x parking on the estate; parking on the road near the house (depending on availability). Outdoor facilities(private use): terrace (roofed), roof terrace, furnishing provided (garden table, 4 chairs), lounge furniture, brick barbecue, pizza oven. The agent describes this villa as a family friendly holiday rental ideal for the summer holidays. It is also good value for money. This villa is located in Sant'Antonino. The nearest airport is only 47km away. It is set in a very convenient location, just 0 metres away from a beach and only 2.5km away from the city center. The villa has free wireless internet. The villa is well equipped: it has air conditioning, a dishwasher and a washing machine. It also has a BBQ. There is a golf course nearby. The villa is suitable for family friendly summer holidays; it is also suitable for elderly guests.